Van Racking is offered for a range of Nissan work vans. In order to operate in tough conditions while providing ease of use, Nissan work vans need van racking suited both to the van and most importantly, to you. The smallest model, the NV200, has 4.2m³ of loadspace, enough to swallow two Euro pallets – and with wide-opening rear doors and one or two sliding side doors, loading is swift and easy. The passenger seat – with its optional foldable functionality – creates a useful desk with power outlets and handy storage spaces. With the mid-range NV300 model, you get a practical, comfortable and safe van fitted with the latest high tech driving features. The largest Nissan work van, NV400, is available in several different designs, which enables you to maximize the space to suit your needs. It can carry up to 17m³ of cargo and objects of up to 4.4m in length. A low floor and wide-opening doors make it easy to load and unload. Our range of services include Nissan NV400, NV200 van racking among the range of vans offered. More info on complete van racking systems for Nissan vans is available in our custom Nissan panel van spec sheet. Feel free to get in touch with us or one of our dealers when you have any questions. We always recommend that you get your Nissan van racking system installed by one of our dealers. This will ensure that the racking is properly installed. This also gives you a 5-year warranty on the racking and the installation. 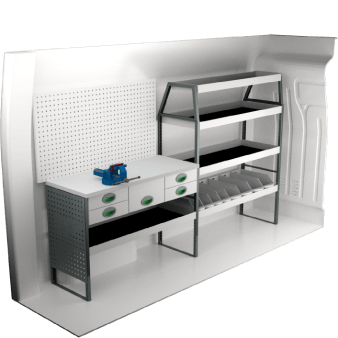 If you install the van racking yourself, we provide general installation instructions and then you have a 3-year warranty on the parts and accessories. If you need any advice, we and our professional installers are always available. Here at System Edström we have developed complete van racking systems designed for your Nissan panel van. We offer van racking for the Nissan NV200, NV300 and van racking for the Nissan NV400. Our van racking designs have been developed with functionality in mind, so they always meet your needs. 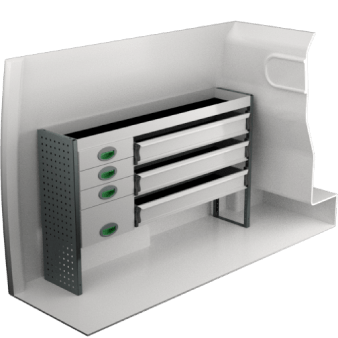 Maybe you simply work van shelving allowing you to store your tools on shelves, or a more complex system including drawers, carry-all bags and other accessories for a Nissan van racking system. Naturally our systems are crash tested. And if you also let our dealer install your system, you get a 5-year warranty into the bargain. In addition to our complete van racking systems, you can custom design your Nissan NV200 van racking. 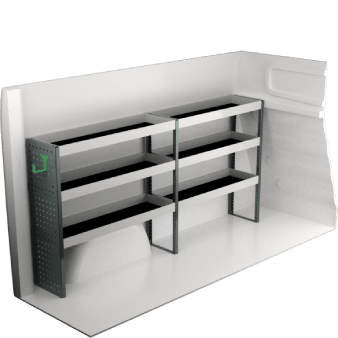 Our system is highly flexible and if you want to remove or add something, or simply get a personally customized van interior, then our Nissan van racking system is the right choice for you. We always recommend that our customers reach out to the expert staff at our dealers to receive the best possible service. If you would rather do your own research before contacting a dealer, you can do so in our webshop. It offers views of the vehicle racking systems as they look in the vehicle and you can even customize the Nissan Van Racking system to suit your needs.